"We need to draw conclusions from the experience the memorandum gave us". 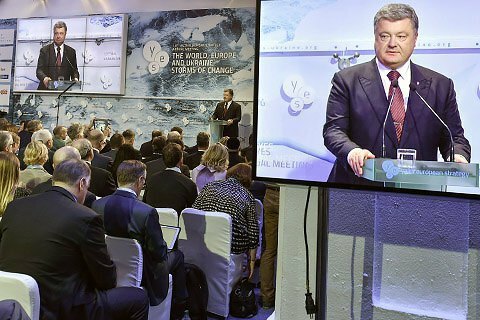 President Petro Poroshenko said that Ukraine wants to conclude new bilateral agreements with the signatory countries of the Budapest Memorandum. "We need to draw conclusions from the experience that the Budapest Memorandum has given us. We need bilateral agreements with our allies to ensure the security of Ukraine," the president of Ukraine said on 16 September at the opening of the international conference Yalta European Strategy (YES). The existing borders of Ukraine were guaranteed by the United States, Great Britain and Russia, laid down in the Memorandum on Security Assurances in connection with Ukraine's accession to the Treaty on the Non-Proliferation of Nuclear Weapons (Budapest Memorandum) in 1994. In 2014, Russia, one of the signatory countries annexed the Crimea, and then sent troops to Donbass. Russia claims it is in compliance with the Budapest treaty as it has threatened Ukraine to use its nuclear weapons. Meanwhile, the US and the UK preparedness to protect the territorial integrity of Ukraine proved to be limited. In particular, Ukraine was denied lethal weapons.